The Gigant self-loading mixer feeder has an enormous loading capacity and preserves the structure and nutritional value of your feed. Its robust cutting board or grab allows easy loading of even large round or square bales and its unique cutting and loading system ensures that feed is cut from the silage without any loss of structure. In short, this is a compact, cost-saving mixer feeder. The Gigant is available in volumes of 5, 7 and 9 m3. The Triomix AL is a silage cutter and mixer feeder with conveyor belt in the back, also available with straw blower (P). 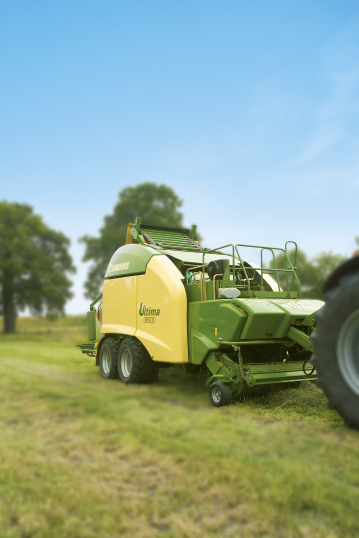 Cut silage, mix and discharge feed, and even spread straw with a single machine. This is something you can now do, thanks to the multifunction Triomix (P) AL. This self loading mixer feeder wagon is equipped with a mechanically powered straw blower, capable of blowing straw into the barn up to a distance of 25 metres. Hay, straw, round and square bales are no problem for the Triomix. The discharge conveyor is located at the rear of the Triomix P.
The Triomix silage cutter and mixer feeder is an economically appealing machine. This self-loading mixer feeder permits just a single person and a single tractor to perform the entire loading, mixing and discharge process. The Triomix features a moving cutting knife and a purpose-designed cutting and loading system that guarantees minimum wastage during cutting and which maintains the structure of the feed. Thanks to its compact form and the excellent view to the rear from the tractor, the robust Triomix is very easy to manoeuvre. The Triomix is also available with a shear blade (Triomix S) and/or straw blower unit (Triomix P). The Triomix silage cutter and mixer feeder is an economically appealing machine. This self-loading mixer feeder permits just a single person and a single tractor to perform the entire loading, mixing and discharge process. The Triomix features a moving cutting or stationary knife and a purpose-designed cutting and loading system that guarantees minimum wastage during cutting and which maintains the structure of the feed. Thanks to its compact form and the excellent view to the rear from the tractor, the robust Triomix is very easy to manoeuvre. The Triomix is also available with a straw blower unit (Triomix P). The renewed Solomix 3 ZK is a mixer feeder with three vertical mixing augers and two side discharge slides (front left and right). The machine is available with a capacity of 30m³. Its characteristic features, such as a specially shaped mixing chamber, made-to-measure augers, an adjusted auger speed and exceptionally high quality, ensure reliability, healthy cattle and savings in terms of time and costs. The Solomix 3 VLX is a heavy-duty mixer feeder, featuring a wider discharge unit, three vertical augers and a cross chain conveyor at front. This trailed mixer feeder is particularly well-suited to dairy farms that wish to process large quantities of feed in a short space of time. The machine is available in volumes ranging from 36 to 46 m³. Whether processing small or large quantities, feed is mixed quickly to produce a mix of uniform structure. Mixer feeder with two augers and a cross conveyor belt at the front. This mixer is available with a capacity from 10 to 20 m³. Thanks to the deep mixing chamber and the large wheels that are placed next to the chamber, this machine is suitable for relatively low barns. A conveyor belt at the rear is also possible. The new Solomix 2 VLH-S is a mixer feeder, featuring two vertical augers with a chain conveyor and an in height adjustable chain extension. This trailed mixer feeder is suitable for both large and small-scale livestock breeders. The shape and dimensions of the mixing auger and mixing chamber are perfectly matched to ensure a perfect mix. Its simplicity means any maintenance costs are minimal and the machine operates at high efficiency. The Solomix 2 VLH-B is a mixer feeder with two vertical mixing augers and a side belt conveyor that discharges to the front. This mixer feeder is suitable for large and small-scale livestock breeders and is available in volumes ranging from 12 to 24 m3. Its characteristic features and exceptional quality make this mixer feeder unique, efficient and a pleasure to work with. The Solomix 2 VLH-B is a front discharge mixer feeder, with durable and solid auger columns that are supported by the chassis. Our patented ’Horizontal Flow’ system ensures the feed is perfectly mixed. Various discharge options are available for the Solomix 2 series, including to the side (ZK) or rear (AL) of the mixer. The Solomix P2 is a mixer feeder with straw blower unit. This mixer feeder allows you not only to feed your cattle a balanced ration, but also to spread their stall with straw, to provide them with the comfort they require. Its compact dimensions make the Solomix P easy to manoeuvre and use in stalls with narrow feeding alleys and a low height clearance. This advantage becomes even more apparent when a smaller tractor is used. The Solomix P2 can furthermore be equipped with an optional dust control system. By wetting the straw, this system ensures that fewer dust particles and microorganisms are floating around, which is not only more comfortable, but also more hygienic. The Solomix P2 has 2 mixing augers. If you are seeking a machine with 1 auger and a straw blower unit, please see the Solomix P1. Click here to learn about all the unique Solomix features. The renewed Solomix P is a two-in-one machine. Equipped with a straw blower, this mixer feeder not only enables you to feed your cattle a balanced ration, but also to spread their stall with straw, to provide them with the comfort they require. Its compact dimensions make the Solomix P1 easy to manoeuvre and use in stalls with narrow feeding alleys and a low height clearance. This advantage becomes even more apparent when a smaller tractor is used. The Solomix P can furthermore be equipped with an optional dust control system. By wetting the straw, this system ensures that fewer dust particles and microorganisms are floating around, which is not only more comfortable, but also more hygienic. The Solomix P1 has 1 mixing auger. If you are seeking a machine with 2 augers and a straw blower unit, please see the Solomix P2. The renewed Solomix 1 ZK(L) is a compact mixer feeder, featuring a single vertical auger and a hydraulic discharge slide on both sides. This trailed mixer feeder is suitable for both large and small-scale livestock breeders and is available in volumes from 5 – 14 m³. The Solomix 1 ZK is available in a range of different heights. The exceptional simplicity of this mixer feeder means any maintenance costs are minimal, while the machine is furthermore extremely easy to use. The Solomix 1 VLH-B is a compact mixer feeder, featuring a single vertical auger and a cross conveyor belt in the front. This trailed diet feeder is suitable for both large and small scale livestock breeders and is available in volumes from 8 – 14 m³. The Trioform auger knives are mounted at horizontal position on the auger flighting. This ensures an optimum cutting performance with less resistance in the feed (fuel saving). The patented Trioform auger knives are self-sharpening and the special shape lead up to a higher strength and long life. Its specific characteristics and high quality make the mixer feeder wagon unique, efficient and very easy to work with.